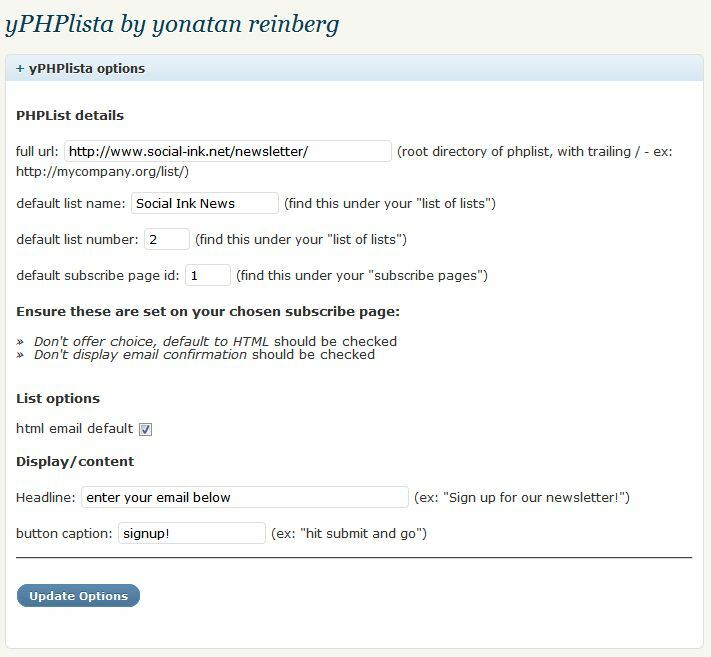 yPHPlista integrates PHPlist, the famous open-source, free and powerful mailing list software, with wordpress smoothly and now with AJAX! Other plugins haven’t been updated in a while, or they don’t work with the latest versions of phplist. importantly, this plugin does all of that but allows you to keep your user on the same page, not send them to an ugly “thank you for subscribing” page. Please note that yPHPlista DOES NOT handle any part of mailing list, or modify phplist. it simply acts as a conduit between wordpress and an already-functioning phplist install. 3. Set it up with your PHPlist settings. 4. Add a new page or post to your wordpress and type in the [yphplista] shortcode wherever you want the signup box to appear. 5. You can now also add yPHPLista as a widget if your theme is widgetized through your backend. 7. That’s all – yPHPlista will take care of the rest. Can I choose different names, ids, subscribe pages? At the current time yPHPLista does not validate email addresses, nor does it employ any spam prevention techniques like reCAPTCHA, etc. If you need this functionality, be in touch for personalized support. note: PHPList has some built in validation (eg it won’t accept .ocm domains for example) but again that’s not part of the plugin. Wow, that’s broad. Have you correctly set up PHPList, created a list, and a subscribe page? All of these things are NOT under the purview of this plugin; basically make sure everything’s running well on that side before you attempt to use this. I have PHPList setup but it’s still not working! Have you created a subscribe page, and entered the correct settings in the plugin settings page? Remember, each subscribe page has an “id” (the default is 1) and we need to make sure they’re created in order to use this plugin. How do I make it go to eleven? Please donate and contact me – I can customize this for your specific site in any way you want! multiple lists (checkbox). other things. yPHPlista by Yonatan Reinberg has been tested on all the latest versions of FireFox, Chrome, and, why not, Internet Explorer. It also validates 100% as HTML5, etc. Note too, as with every plugin or theme modification, you should do a backup of your files beforehand. Although we’ve tested this across many installs, we are not responsible for anything it does to your system and do not guarantee support. Download it here from social ink’s site(48k zip) or go to the wordpress plugin directory for yPHPlista. See it in action – AND – stay updated with all the latest plugin news by signing up for our email newsletter (below in the footer). We always use the software we develop. Go ahead and install, and leave your comments and questions below! If you’re so inclined, please buy me a beer to cover the hours making this plugin by using that big ol’ donate button on the upper right!